Cebu beaches are known for their fine white sand and clear waters. Being in the center of a long and narrow island that is 200 kilometers long and nowhere exceeding 40 kilometers in width, Cebu City is half an hour to a few hours away from white sand beaches, long coastlines, beautiful resorts, and paradise islands. This is one of the reasons why the city is in every tourist’s list of top destinations. Another Cebu to do activity is take a heritage tour of centuries-old churches and Spanish period churches. A trip without a visit to world-class Cebu beaches with their beautiful sunsets and panoramic views is incomplete. From Cebu City, the nearest white sand beaches are those in the smaller island of Mactan to the east. The airport is located in Mactan, under the territorial jurisdiction of Lapu-Lapu City. Going to Mactan Island is easy as two bridges connect it to mainland Cebu — the Mandaue-Mactan Bridge and Marcelo B. Fernan Bridge. Mactan Island consists of Lapu-Lapu City and Cordova town. From the city, Mactan is about 45 minutes to an hour drive. Most Mactan, Cebu beaches are just 15 to 30 minutes ride away from the Mactan-Cebu International Airport. To get here, one option is to take a taxi. The flag down rate is P40.00 (temporarily set at P30, but you have to ask the driver to subtract P10 from your actual fare) and taxis are widely available anywhere in the city as well as in the island. Resorts usually offer shuttle transfers to their guests. You may arrange for airport pick-ups or drop-offs. There are also shuttle services going to and from the malls in Cebu City for a fee. Be Resorts in Mactan Island. True to its tagline “Beyond the Expected,” guests here will surely get the relaxation they deserve. An Infinity Pool that is four feet deep immediately creates a calm mood. The Jacuzzi Pool is also hard to resist, especially for those who need to break free from their daily routine in office or at home. Situated on Punta Engaño Road, the resort has unique names for their accommodations — Be Cool, Be Chic, and Be Classy. If you do visit Be Resorts, make sure you try its boodle dining package: to know more about it, read our story: Be Resorts Mactan introduces Boodle on the Boat. This resort located in Punta Engaño, Lapu-Lapu City offers its guests a vacation in luxury. The garden view appeals to nature lovers and is an ideal place for travelers. Considered as a premier resort in Mactan island, Shangri-La’s Mactan Island Resort and Spa boasts of a large spa and various restaurants. Saltwater lagoons and freshwater pools distinguish Plantation Bay Resort and Spa from the others. With its colonial plantation architecture, guests will surely enjoy the amenities of the resort. Here, athletic tourists could not resist their wall climbing facility while health conscious guests would love their fitness center plus the spa at their Mogambo Springs. The resort lies in an 11.4-hectare lot in Marigondon, Lapu-Lapu City. Other than being known for its bungalow type of accommodation, Maribago Bluewater Beach Resort has become a favorite venue for weddings. Couples who are fond of the beach often choose to hold the reception in its 1.1 hectare man-made island dubbed Alegrado Island. Kids also are attracted to visit the place and have an encounter with the mascot Dolpo, a dolphin. This 158-room resort is located in Maribago, Lapu-Lapu City. If you talk about water fun, this resort is definitely the best place to go. Located on ML Quezon National Highway, Maribago, Lapu-Lapu City, it offers a one of a kind Waterpark and Slides. Imperial Palace Waterpark Resort and Spa features themed pools namely Amazon River Pool (with inflatable tubes), Wave Rider, Beach Pool, Captain Hook’s Pool, and the Toddler Pool. Value for money is what best describes this resort in Tongo, Marigondon, Lapu-Lapu City. For only an entrance fee of P50.00, one can get a nice dip in the beach. The resort is a perfect option for those who are looking for an affordable get together. You are allowed to bring in food and the cottages are for rent at reasonable costs. Farther away from Cebu City are unspoiled beaches with fine sand and cool waters, but they take travel time of two to three hours or more. Down south, you will discover hidden paradise in the towns of Boljoon, Santander, Alegria, and Moalboal. Exploring southern Cebu is easy even for those who do not have cars. You may take buses at the Cebu South Bus Terminal along N. Bacalso Avenue in Cebu City to destinations in the south. There are also van-for-hires available at the Citilink, also on N. Bacalso Ave., and Ayala Terminal. Lambug beach in Badian is among the best in Cebu. For years, this secluded public beach with its long stretch of fine white sand in Badian was deemed a secret among regulars loathed to share it with others lest the rush of crowd ruin its pristine state. 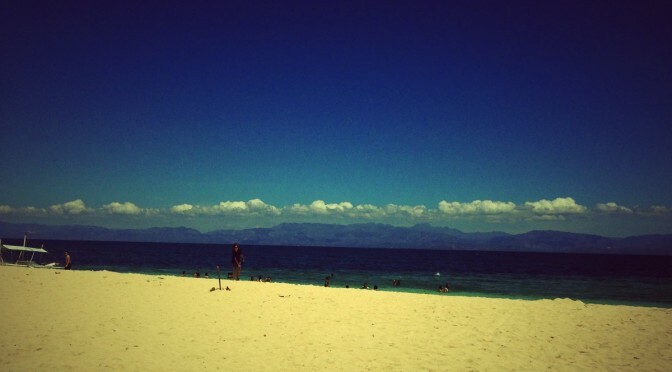 Lambug offers one of the best and cleanest beaches in Cebu. It is a three-hour drive from Cebu City. This resort in Boljoon is very accessible to tourists as it is located on the highway. From Cebu City, this town is about three hours away. Coming here is not too expensive as you can either stay for a night or just spend the whole day there enjoying the beach. They have open cottages for rent both for day use and overnight stays. They also have a pool for those who wish not to take a splash in the beach. Snorkeling and diving are two of the best things to do while here in the resort. Since Boljoon is known for its heritage sites, they also offer Church visits for guests. With only 10 rooms, guests in this resort located in Liloan, Santander are assured of private leisure. The place is perfect for honeymooners and in fact is best described as couples’ retreat. Guests here will surely love the sea view from the room. The resort has spacious and big rooms. What is nice as well is they offer hassle-free package and room-only rates. If you wish to take a vacation without worrying too much about other details, their all-inclusive rate best suits you as it comes with meals and leisure activities already. Among the things to do here are ocean kayaking, mountain biking, motor cycling, snorkeling and many others. From Cebu City, Santander is approximately a three-hour drive. Buses stationed at the South Bus Terminal will take you to this town. As additional tip, you may board a fast craft or motorized banca from Santander going to Sibulan, Negros Oriental. Sibulan is about 15 to 20 minutes away from Dumaguete City. Once a quiet town in the south, Alegria is now becoming an option for tourists and honeymooners as this resort features an inviting 10 x 20 meters infinity pool. Other than swimming, guests could take a waterfalls tour, go hiking and feel relaxed staying at their spacious accommodations. Also, busy professionals would not worry about their responsibilities even while in vacation as the resort has wifi connection. The town of Alegria, via the Barili route, is about three hours travel time from Cebu City. True to its name that means House of Good Energy, the owner of this resort believes and put into practice permaculture — a way of producing food and energy without depleting the earth’s gift of nature. Offering only seven rooms, this resort in Barangay Saavedra in Moalboal is perfect for family reunions, team buildings, and other intimate gatherings. This one’s a favorite among beach campers and the Holy Week crowd. Basdako or the White Beach is located in Barangay Saavedra, Moalboal. It is a public beach with cheap lodgings and, further away, exclusive resorts. You can also rent tents for camping out on the beach. To read more about Basdako, go to our article: Camping out on Basdako beach in Moalboal. Basdako or White Beach in Moalboal. North of Cebu, there are resorts to visit as well, such as those in Danao, Sogod, and San Remigio. Buses going to the towns in the northern part of the province are stationed at the North Bus Terminal in Subangdaku, Mandaue City. Those who want to enjoy the famous Bantayan and Malapascua islands need to ply the northern route and take a boat ride from the Hagnaya Port and Maya Wharf, respectively. Located just along the national highway, this resort in Danao is easy to find. It offers 39 accommodation units and has facilities such as the Elsa Spa, a lagoon swimming pool with waterfalls and outdoor jacuzzi, Coco restaurant, and Buddy’s KTV. For athletic travelers, it has a fitness gym and volleyball court. Internet access is available to guests, thus busy professionals need not worry coming here. Also in Danao, this resort is the best place to go for a great water fun. With an entrance fee of P150.00 per adult, P75.00 for kids age 7 to 11 years old, you would surely experience an adventurous day under the sun. Not only they have the beach and the pool, they also have a waterpark that provides four inflatables for guests to enjoy. It is open from 8 a.m. to 5 p.m. and the rate is an affordable P100.00 per person. The pool, on the other hand, is open from 8 a.m. to 10 p.m.
And if you feel that one day is not enough, it has accommodation units for overnight stays. This resort located in San Remigio is an answer to those who are looking for a good venue to hold reunions, birthdays, and weddings. Its Sea Pool Party Area is very spacious and perfect for luau parties. One nice thing here is that it offers various packages for groups. Among these are Group Tour Package, Day Tour Package, Side Trip Package and many more. For transportation, it has coaster and van service that is very convenient for groups. Other option is to take a bus that costs only P120.00 per person. From the city, the town of San Remigio is three hours travel time. Midwest Cebu beaches are comparable to other destinations in the Cebu island and the resorts here are equally worth your travel. Six towns and one city make up the midwest part of the province — Balamban, Tuburan, Tabuelan, Asturias, Pinamungajan, Aloguinsan, and Toledo City. To get here, there are vans-for-hire from the CitiLink Terminal or take buses at the South Bus Terminal in N. Bacalso Avenue in Cebu City. With a minimal entrance rate of P20.00 per person, you will enjoy this little paradise in Tabunok, Tabuelan that boasts of fine white sand beach. The place is fit for barkadas and family gatherings. It has rooms that could accommodate two to eight persons. Also, it offers big tents for 20 persons and small tent for 15 persons. It both has air-conditioned and non-air-conditioned rooms. Very native, the resort’s cottage has nipa roof. And you will be able to cook your own food there as there are gas stoves and a refrigerator. The town of Tabuelan, from the city, is about three hours travel time. A retirement home open to tourists, this resort in the boundary of Toledo City and Pinamungajan town is true to its name that means serene, relaxing, and peaceful which are the translations for the Cebuano term “tawhay”. A cottage-on-a-pond could accommodate more than 40 guests. It also offers air-conditioned rooms fit for families and barkadas. This would be a perfect venue as well for special occasions. For guests coming from the airport, the resort provides shuttle service but for a minimum number of five passengers. From the city, the area is less than two hours drive. There are boat trips in Toledo City going to San Carlos in Negros Occidental, thus while enjoying the resort you might want to consider a side trip to the neighboring province.